During the long, Michigan , winter months, I'm always on the lookout for a good body moisturizer. I purchased two LUSH Cosmetics massage bars during their after Christmas sale. 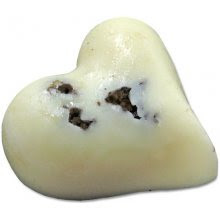 My friend recommended the Mange Too Massage Bar, and I also bought the Soft Coeur, aka the honeymooner, because I liked the scent. They are solids, but melt within 2 seconds of being in your hands. Once warm, they will glide over your skin as a moisturizing lotion. They are a little on the greasy side, specifically made for massages, and will leave your skin glistening and a bit slick. These are made with natural butters and oils (like most LUSH cosmetics). One warning: wait a good 15 minutes before dressing in your Sunday's best, they are pretty greasy and will stain! Find your local LUSH counter or store at www.Lush.com.